As soon as I heard that Bono was injured, I expected the U2 concert tickets that I bought through StubHub in January to be like a lead weight around my wallet. 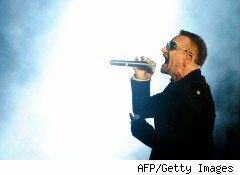 My credit card was charged for the concert tickets after the seller accepted my offer, and I didn't want StubHub hanging onto my money for a year while Bono recuperated. I waited a day to call the company, and using some of the consumer complaint tips from WalletPop and the New York Times, I got a full refund. "Tickets for the original date will be honored. No refunds will be issued at this time. We will inform you of any updates regarding this event as soon as information is made available to us. However, we recommend that you regularly check with the venue or artist's website for the most up to date information. " I don't know what happens to the anonymous seller who resold his or her U2 tickets to me on StubHub, which works as a middle-man between sellers and buyers. I assume in this case they'll have to try again to sell the tickets. StubHub's website doesn't make it easy to call, but I found a toll-free number and gave it a ring. After some prompts from the automated system, I got a live operator and asked what was going to happen with the concert tickets. He said he didn't know, since it was so early, but that the company's usual policy is to have customers keep the tickets for the rescheduled show. Also, a customer service credit of some unknown amount was likely to be credited to my account for future tickets, he said. Following a typical consumer complaint tactic, I asked what he'd do if in my shoes, since I preferred to have a refund now instead of waiting a year for the concert to happen. I'll try to buy more tickets when the show is reset. The operator told me he'd ask a supervisor, and within minutes I was approved for a full refund. I was given a one-time customer exception, I was told, which was confirmed within minutes in an e-mail: "We don't normally allow buyers to cancel their orders; our policy is that all sales are final." Being nice, turning the complaint into a conversation and getting a little empathy helped turn a "final" sale into a refund.